Wildcat Well Logging operates in many areas in Oklahoma, Texas, Kansas, Arkansas, New Mexico, Colorado, and Nebraska. In our backyard, the Anadarko Basin is the mainstay of our company. 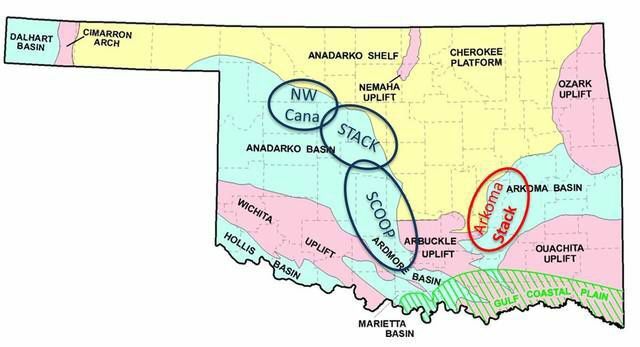 We have logged all of the major plays in the area, including the STACK / SCOOP / Merge plays, as well as Marmaton / Cleveland sandstone plays, and Granite Wash plays, as well as smaller plays in the Ardmore and Marietta Basins. Close to our main office in Oklahoma City, Wildcat Well Logging can provide excellent support to the logging units that are just a few hours away. The Sooner Trend Anadarko Basin Canadian and Kingfisher Counties, or STACK play, has started to get a lot of interest lately, due the potential of producing liquids, while keeping water disposal to a minimum. Wildcat has drilled wells in these plays for years, and can offer many experienced mud loggers. Wildcat has operated for years in the Texas Panhandle, as one of the premiere logging companies in the area. Cleveland / Marmaton, Canyon Wash, Granite Wash, Wolfcamp, you name it. Anadarko Basin, Canyon Basin, Dalhart Basin, or Palo Duro Basin, we know the Texas Panhandle. The Arkoma Basin is getting more attention, but drilling has occurred there for a long time. Recently, the Arkoma Stack has begun to see a lot more drilling activity. Wildcat Well Logging has hundreds of wells logged in the counties that matter, and excellent mud loggers who have years of experience in the area. The Permian Basin never stopped drilling during the recent downturn. New discoveries and techniques have led to the Permian being one of the biggest plays in the country. Wildcat Well Logging has excellent mud loggers who specialize in the Permian, as well as the logistical strength to support and keep trailers in the field. Whether you are drilling in the Delaware Basin or the Midland Basin, we can mud log the well. Wildcat Well Logging can offer mud logging services for Barnett Shale wells in North Texas.